Hello! Today, I'm taking the train back to Philadelphia to finish up this semester. I'll be back in Philadelphia for about two weeks and then I'll head back to Richmond for about a month for a much needed winter break. I can't wait to be done with this upcoming last week of classes and then finals. I'm excited to start anew next semester- even though I'm taking 7 classes next semester. Next semester will definitely be a busy one! I styled my look today around this green polka dot dress. Chilly weather prompted me to layer a gray knit sweater, plaid scarf and green winter coat over the dress. 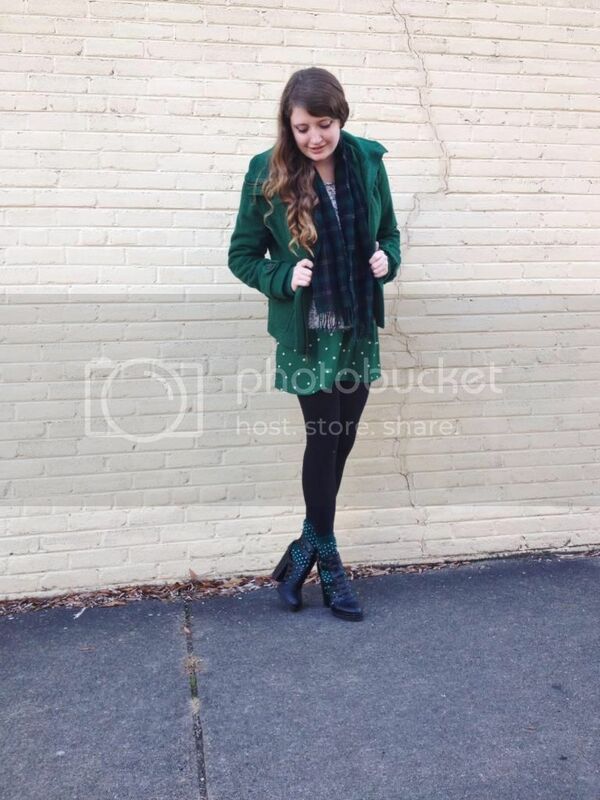 I played up the polka dot print in the dress by layering a pair of green polka dot socks over a pair of black tights. Black cut-out booties completed the look. Hello! I'm pleased to announced that I was featured in this week's Links a La Mode on Heart IFB. Check out the rest of the great articles featured. For those of you in the US, Happy Thanksgiving! While we're all laying around the house waiting for the turkey to come out of the oven, or rooting for their favorite dog to win the National Dog Show, or rooting for their favorite football team, or playing Just Dance on the Wii, just because we're getting cozy today doesn't mean we're not chic. Cozy up to this week's roundup and have a wonderful day! Hello! Happy Thanksgiving! I hope that you guys all enjoy today and are able to spend time with your friends, family and all the other people that you are thankful for. For today's look, I slipped a knit cream sweater over a black bralette. 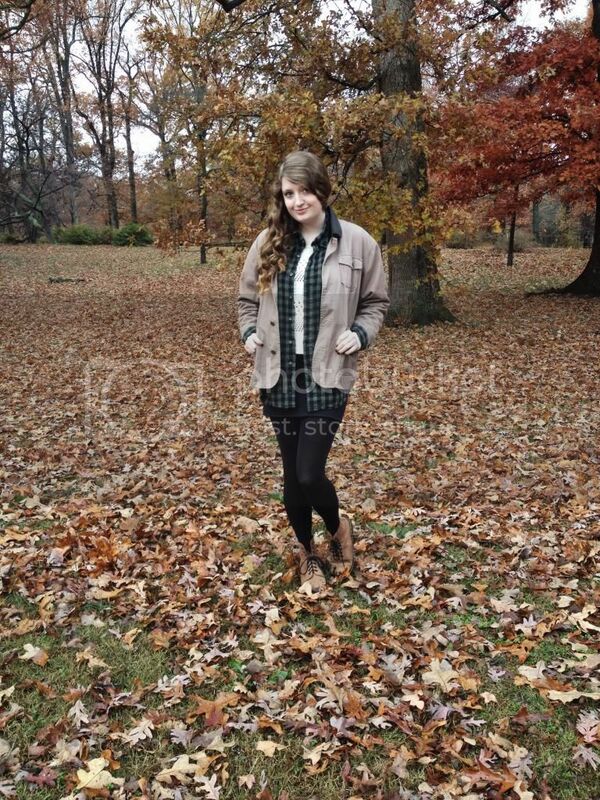 I layered a dark green checked button down over the knit sweater and layered a vintage, tan jacket over top of that. I love how the different textures and neutral colors of all of the tops look layered together. I styled my black skirt from Skirt the Issue with the look. I received this skirt about a month ago and have been in love with it ever since. The classic shape and color make this the perfect skirt to style with numerous, different looks. Not to mention the fact that it's also incredibly comfortable. If you are looking for a versatile skirt to add to your wardrobe, I would definitely recommend checking out Skirt the Issue's selection of skirts. All skirts retail for $30 each. On a related note, I recently started working as an intern for Skirt the Issue mainly working with the online and social media aspects of the company. I feel so lucky to be working as an intern for Skirt the Issue and really love the company that I'm working for. Working in social media/PR after I graduate from school would be a dream so I'm very grateful for the experience that I'm gaining from this position. Be sure to check Skirt the Issue out on social media (Twitter, Facebook & Instagram) to keep up with my work for Skirt the Issue. Hello! The weather is cold and rainy here today and I have little motivation to leave my bed. I took these photos earlier in the day when there was a lull in the rain. 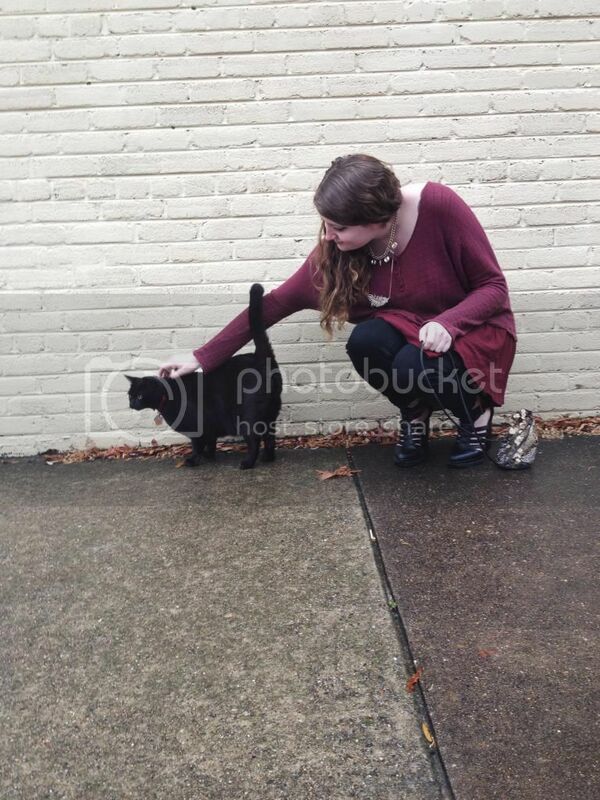 While taking these photos, the cutest black cat decided to join in as you can tell from the second photo above. For me, rainy weather is sweater weather so I slipped into a burgundy sweater today. The oversize shape, burgundy color and bohemian, free-spirited vibe of this sweater make it my favorite sweater in my wardrobe. I haven't worn this sweater in a while and the second that I pulled this sweater on, I remembered all the reasons why this is one of my favorite sweaters. I would spend everyday in this sweater if it was socially acceptable. I paired the burgundy sweater with a classic pair of black denim. I love the way that these pants accentuate my legs. Black cut-out booties accompanied the burgundy sweater and black denim. I accessorized with a couple golden necklaces and a small golden bag. Hope that you guys are enjoying your Thanksgiving break so far! Hello! I just arrived in Richmond last night for Thanksgiving break; I'm extremely grateful for the break from Philadelphia and all my school work even though it's just a week-long break. And nothing's better than being home and being able to cuddle up with my Yorkie, Bella. For my look today, I slipped into a simple teal dress. 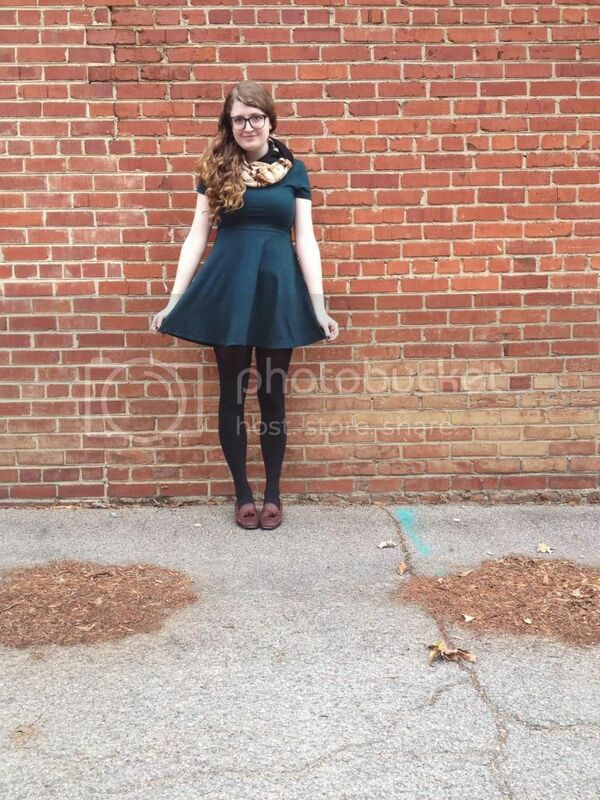 I purchased this teal dress from Forever 21 for less than $20 about a month ago and am very satisfied with my purchase. The deep teal color and flattering shape of this dress are irresistable. I kept my look relatively simple today and styled a black pair of tights, vintage loafers and an infinity scarf with the dress. Hello! 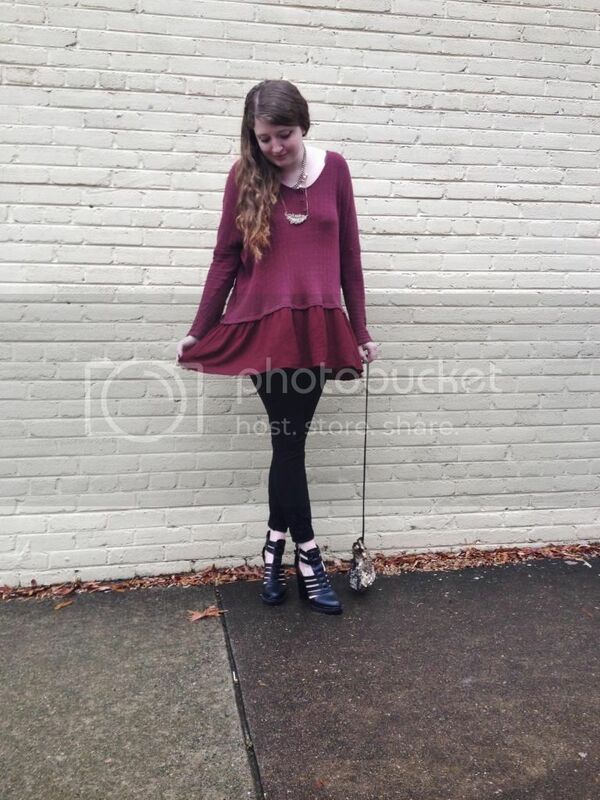 Above are a few of my favorite photos from Free People's November lookbook. The looks are very put-together but there is still definitely the distinct Free People bohemian influence in the looks. Darker colors and metallics dominate the November lookbook, creating the perfect looks for this Holiday season. The jumpsuit in the first photo immediately captured my heart and I've been dreaming of all the different ways it could be styled. It would be great with a cozy sweater for a day spent inside curled up or with glam jewelry and heeled booties for a holiday party. 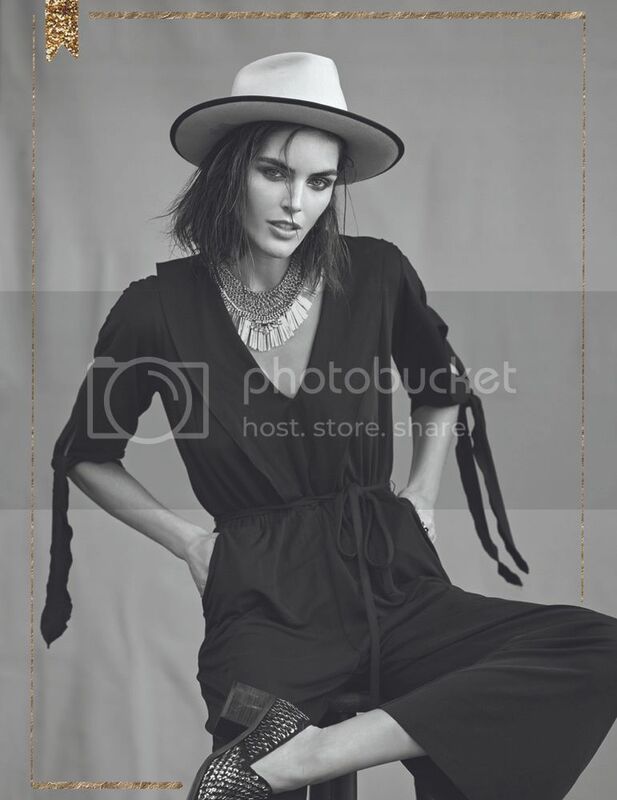 What do you guys think about Free People's November 2014 lookbook? 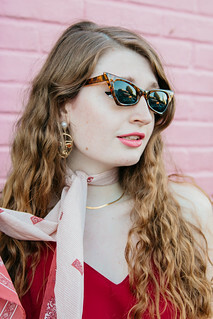 Photos sent over by Free People. Hello! Today, I pulled my favorite pair of pants out of my wardrobe- a floral patterned pair of bellbottom pants from Forever 21. The bohemian print and easy, free-spirited shape of the pants tempt me into wearing these pants constantly. I styled a textured knit sweater with the pants to keep warm. I don't know how I would survive this winter without this mixed gray sweater; it is incredibly warm and cozy. Additionally, it can be styled with nearly everything in my wardrobe. I love it with these printed pants but love it just as much paired over a dress with thigh-highs. 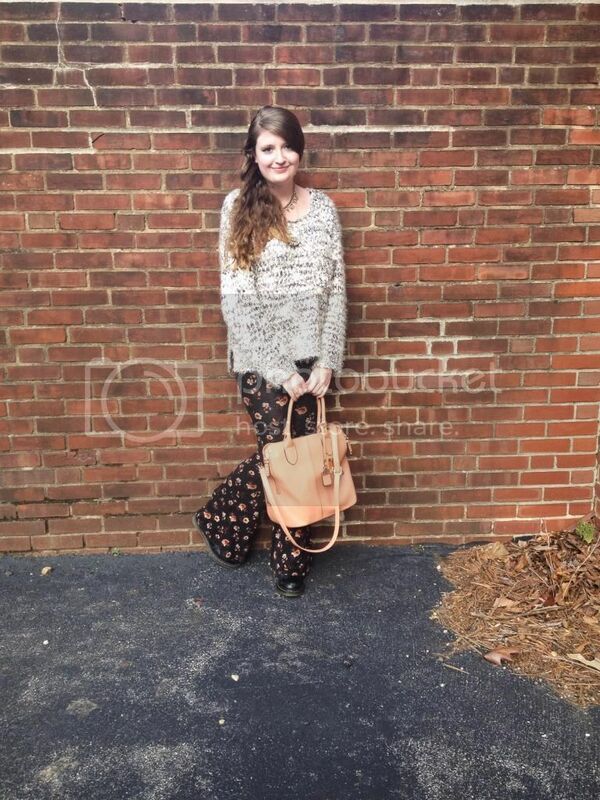 I accentuated the colors in the print of the pants with a peach-colored tote bag. A couple golden necklaces and black combat boots completed the look. Hello! As it gets colder and colder outside, I begin to think more and more about the holiday season. Evergreen trees, hot cocoa, snow, sledding, curling up in layers upon layers are all occupying my mind. One of the other things that's weighing more heavily in my mind is what to get everyone for the holidays this season. Shopping for gifts may be one of the hardest parts of the holiday season. It's always a struggle to find the perfect gift for your friends and family members at a perfect price. And there's so many shops out there to browse from. Even just figuring out where to buy their gifts can be intimidating. In my opinion, one of the best places to buy gifts is Etsy. Etsy is an online marketplace where individuals and shops can sell their handmade goods and vintage items. Etsy is the go-to for unique gifts. By purchasing a gift from Etsy, you can be fairly sure that no one else will be giving them the same gift. Today, I've rounded up a few Etsy shops that would be the perfect place to do your holiday shopping. 1. Chromosphere.This etsy shop specializes in handmade jewelry made from various crystals and quartz stones. The pieces are all very free-spirited and bohemian. Prices range from $5-$25. This shop has countless great necklaces that would make the perfect holiday gift. Be sure to check out their Druzy Occo Necklace for $12. 2. Corscandles. Corscandles has the most incredible vegan candles. Candles are shaped like pyramids and give off the coolest effect when burned. Corscandles has a great selection of different sizes and colors to choose from. Prices range from $5.50- $34. I'm particularly in love with their Vegan Lavender Candle which sells for $14. 3. A Girl Named Leney. 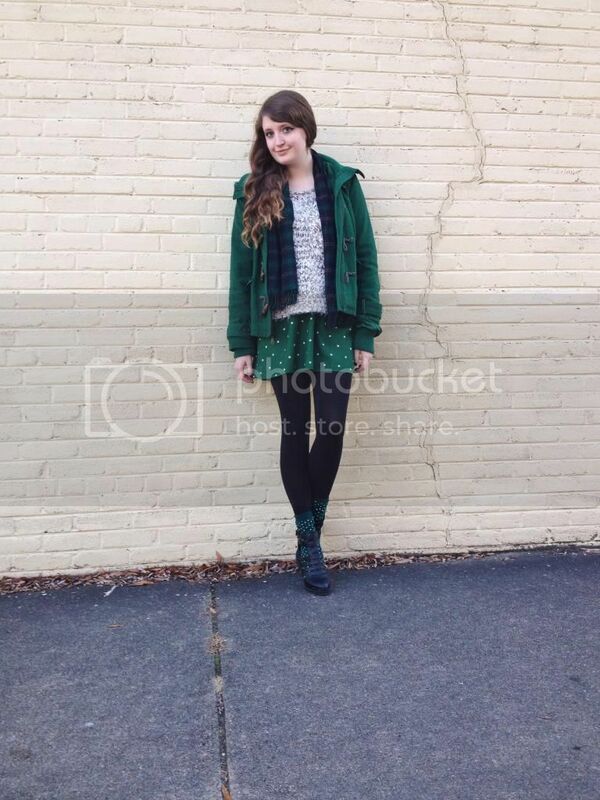 A Girl Named Leney sells gorgeous knit pieces. Leney is based in Richmond and I actually met her a while back; she's the sweetest person and her shop is just as sweet. Her knit pieces are sure to please whoever you're shopping for. Prices range from $30-$150. My favorite piece from the shop would have to be the Paris Drawstring Bag which retails for $55. 4. byMart. byMart sells handmade bags and accessories. They offer a wide selection of different bags to choose from. Prices range from $6-$90. For just $6, I'm dreaming about their leather tassels which come in a variety of different colors. 5. Kate Broughton. Looking for a gift for an artsy, quirky friend? Kate Broughton is the first shop you should head to. Animal print cards, nail decals, stickers, tattoos, stationery and mirrors would all make the perfect gift. Prices range from $4.02- $56.22. Be sure to check out their Black Cat Nail Transfers for $4.82. Don't have an etsy account? Sign up using THIS link and save $5 off your first purchase. 1. Socks & tights. Lots and lots of socks and tights. Knee-high socks, thigh-high socks, crew socks, sheer tights, opaque tights, stock up on them all. If you wear dresses and skirts as often as I do in the winter, these socks and tights will save you from the cold again and again. And you're definitely going to want to layer your socks and tights as the winter progresses. I love pairing printed crew socks over a pair of thigh highs or sheer patterned tights over a pair of cozy opaque tights. Pairing socks will keep your cozy while still stylish. 2. Heavy coat. Definitely an essential. Choose a heavy coat in one of your favorite colors that you can easily slip on with any of your looks. I have a great black peacoat that I constantly wear as well as a furry leopard print coat and I am definitely grateful for them. 3. Plaid wool scarves. Wool is so much warmer than other fabrics so wool scarves are a winter layering must-have. I'm currently swooning over plaid wool scarves in particular. If you're looking to add a plaid wool scarf to your wardrobe, I would definitely recommend checking out thrift shops first for a great deal on a vintage wool scarf. Usually, scarves like these are abundant in thrift shops. 4. Thick leggings. Layer these under dresses/skirts as well as with other pairs of leggings. Better than tights for those absolutely freezing days. 5. Chunky knit sweaters. No explanation needed. 6. Knit infinity scarves. Brave the cold with a knit infinity scarf. I don't think I could survive the winter without my knit scarves. Forever 21 and Etsy usually have some great options for knit scarves. 7. Long-sleeve button downs. Layer these under cozy knit sweaters or open over other tops. Either way, button downs are extremely easy to layer. Bonus points for button downs in winter prints such as plaid. Hello! Today, my friend, Amanda, and I took a few photos after class. 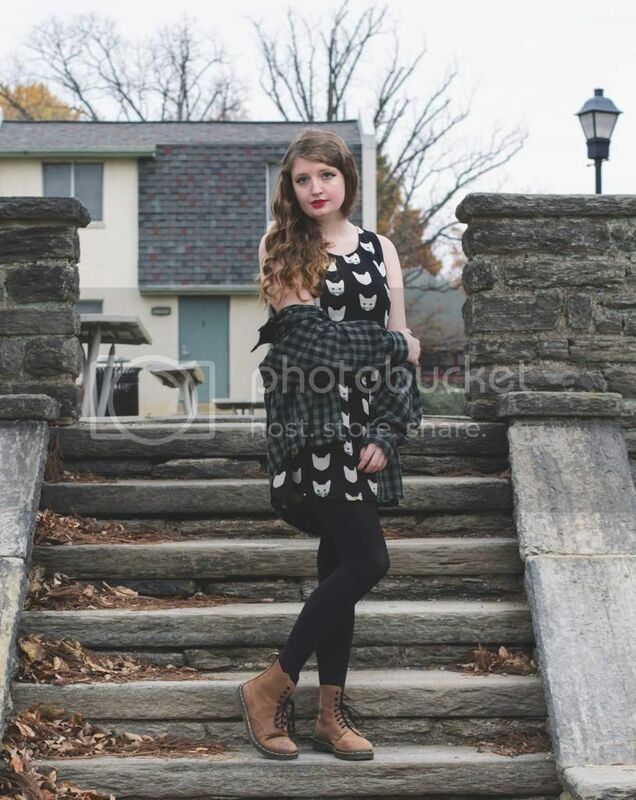 Amanda is also a fashion merchandising major at PhilaU but minoring in photography. She has taken photos for my blog before and I can't get over how incredible she is behind the camera. I really love this shot from today. Check out a few other photos from our shoot on her Facebook page, Amanda Remillard Images. Now, more about today's outfit! This morning, I was majorly lacking fashion inspiration so I decided to fall back on a wardrobe go-to, my cat print dress. This dress is one of those dresses that is the easiest to slip on when I don't know what else to wear. The shape is very flattering and the print and colors of the dress are very versatile. This dress works for all seasons and with most other items in my wardrobe. I decided to style the dress with a dark green and black, checked flannel today. This flannel is so cozy and I couldn't resist it as the weather was significantly chillier today than it was yesterday. For this look, I also slipped on a pair of black opaque tights and vintage Doc Martens. Red lipstick added the final touch to the look. Hello! I took advantage of today's incredible weather and decided to don a white circle skirt. This circle skirt has been hidden in the back of my dresser for several weeks now as I see it as more of a spring/summer skirt rather than a fall/winter skirt. However, I couldn't resist wearing it today especially with such gorgeous weather. I styled a cozy, knit sweater with the skirt to make it more November appropriate. I only purchased this sweater recently but have been obsessing over it ever since I purchased it from Forever 21. In fact, I even wore the sweater the night after I purchased it. For the past couple weeks, this sweater has been on repeat in my wardrobe and I'm tempted to wear it everyday. This craze over a specific item in my wardrobe is not new for me. 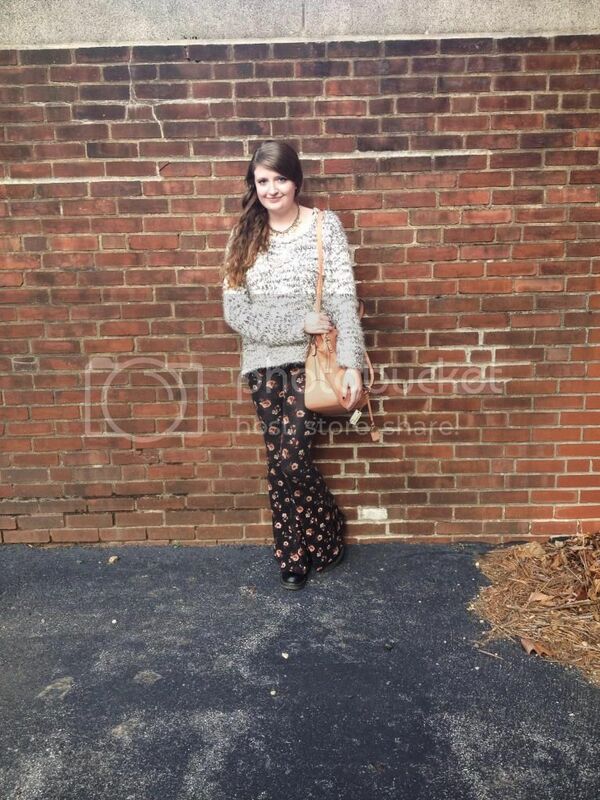 Earlier this fall, I was crazy about my burgundy sweater and printed flare pants. And I still am crazy about them but wear them much less often. Years and years ago, when I was in elementary school, I had a pair of jean capri pants that I was obsessed with and wore them so much that my mom limited me on the number of times that I could wear them per week. So I guess you could say I easily fall in love with items in my wardrobe and demonstrate that love by wearing them...again and again and again. I amped my look up a few inches with my pair of Jeffrey Campbell "Girl Crush Platform Heels." I purchased these from Nasty Gal a while ago and couldn't be any happier with them. They are extremely comfortable to walk in and very stylish. I mean you can't really go wrong with a pair of Jeffrey Campbells, right? Hello! For my look today, I decided to mix a few different patterns together. There's nothing I love more than playing around with various prints and seeing how various prints complement each other. I started my look with this black polka dot, body-con dress. This dress has proved time and time again to be such a great piece for layering. The versatile fit and plain colors of the dress make it extremely easy to pair with nearly every item in my wardrobe. 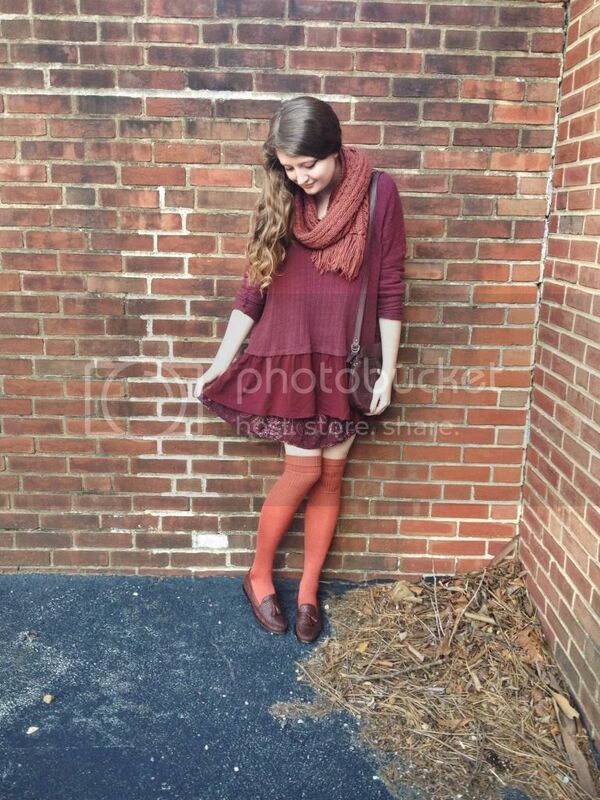 It's great for pairing under a circle skirt or great with a cozy sweater layered on top of it. Today, I paired it under a plaid shirt-dress which I wore open, unbuttoned. 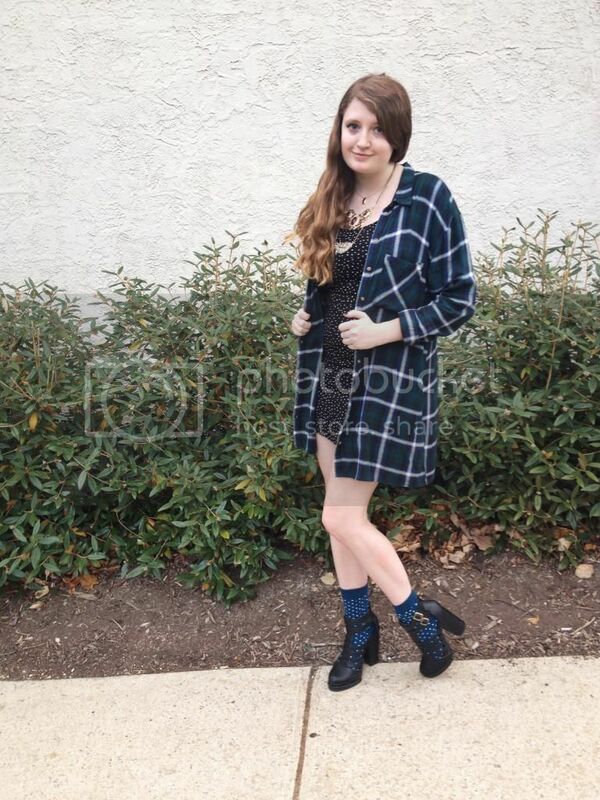 This plaid shirt-dress has also been one of my recent go-tos. The classic print and rich winter colors draw me back again and again to it. I like the way the plaid of the shirt-dress accentuates the polka dots of the dress underneath of it. 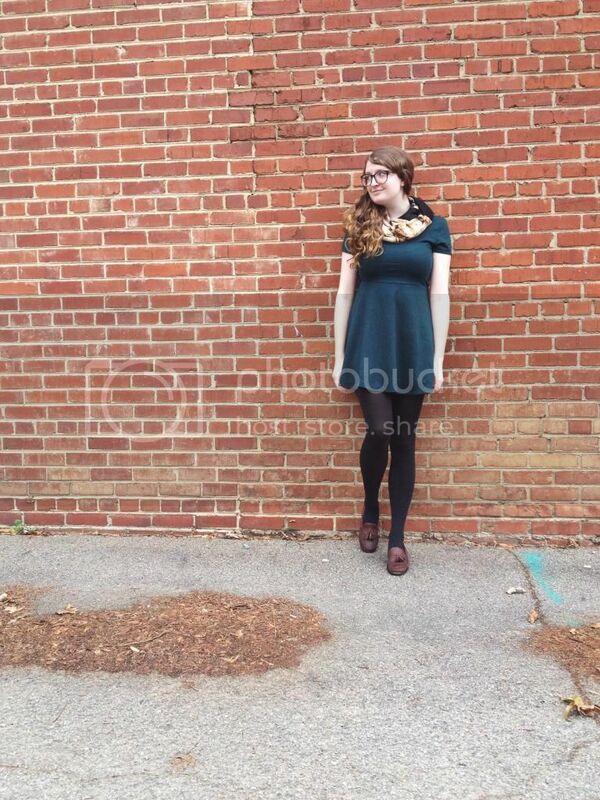 This dress/shirt-dress combination was also ideal for the warm November weather today. I played around with another print by slipping on a pair of navy and white polka dot socks underneath a pair of black booties. The print of the socks is almost like a combination of the prints of the two dresses- it's similar to the polka dot dress because they are the same print and similar to the plaid dress because they are a similar color. The print of the socks tie together the two different prints of the dresses perfectly. Several golden necklaces completed the look. 1. Cozy sweater in a rich fall tone. Perfect for keeping warm as the weather gets colder and colder. 2. Glitter nail polish. There's something about the holiday season that makes me want to deck my nails out in glitter. This is the perfect stocking stuffer. 3. LUSH bath products. I'm absolutely in love with these luxurious bath products but they are slightly more expensive which makes them the perfect item to put on a holiday wish list. Gotta love the broke college student lifestyle. Additionally, the environmentally and socially conscious mission behind all LUSH products draws me to them. Read an article I wrote about LUSH this past summer HERE on RVAMag. 4. Candles. The ambience candles bring to my room at school instantly make it feel more like home and I would love more candles for my room. 5. Quirky socks. Socks may supposedly be a cliche Christmas gift but like I posted earlier this year HERE, cute socks are everything to me. I would love to wake up with a few pairs of quirky socks in my stocking on Christmas morning. 6. Free-spirited jewelry. I'm coveting bohemian pieces of jewelry this season. I love Free People inspired pieces and vintage pieces. Instead of visions of sugarplums dancing in my head, I've been dreaming of opulent necklaces, stone rings and quartz pendants. Hello! 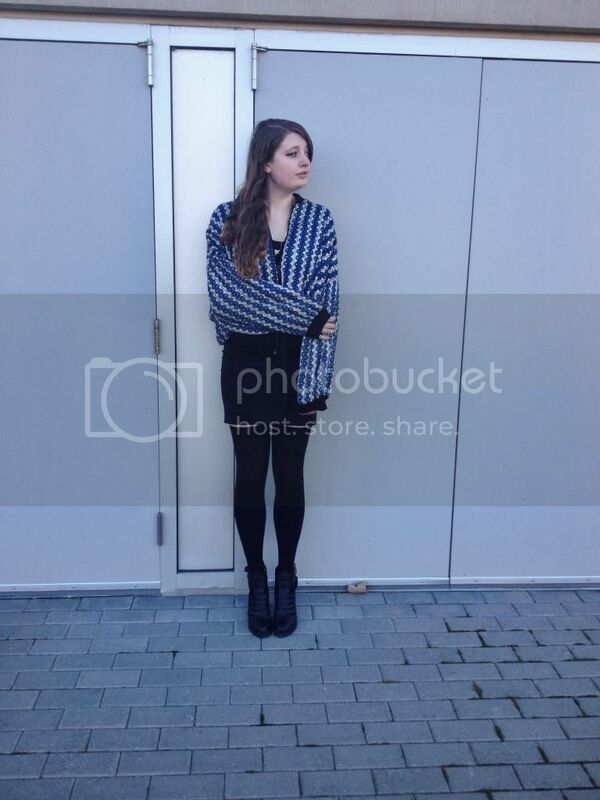 This photo was taken of my outfit yesterday (as you may have noticed if you follow me on Instagram @toriradday.) Shout out to my friend, Emily, for taking this photo for me; thanks girl! 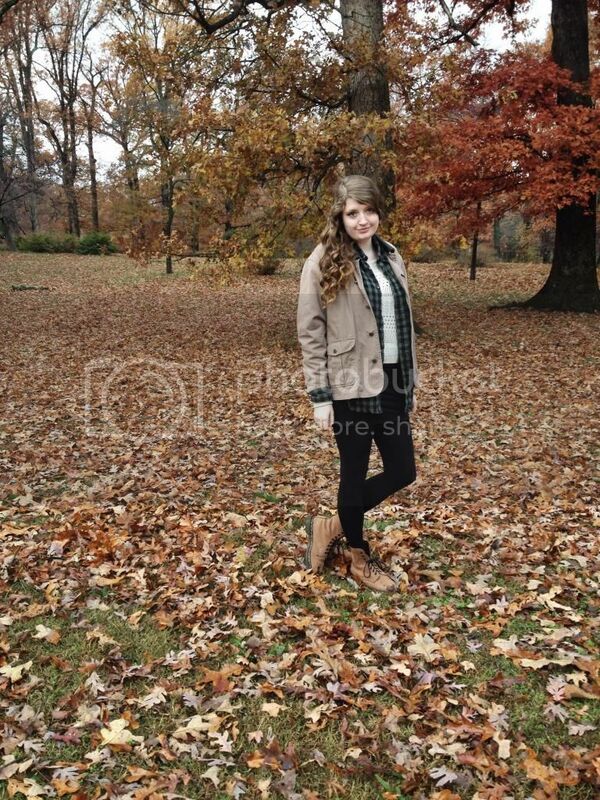 Like myself, Emily is also a fashion merchandising student at Philadelphia University. Be sure to check her out and follow her on Instagram @emily_willi. When in doubt of what to wear, it's always easiest to don an all black outfit. All black outfits are just so effortlessly stylish and incredibly classic. However, it's easy to take an all black outfit from fab to drab in just a matter of seconds. When styling an all black look, the texture and shape of the garments must be kept in mind. Mixing textures and fits of the garments is key in creating the perfect all black look. 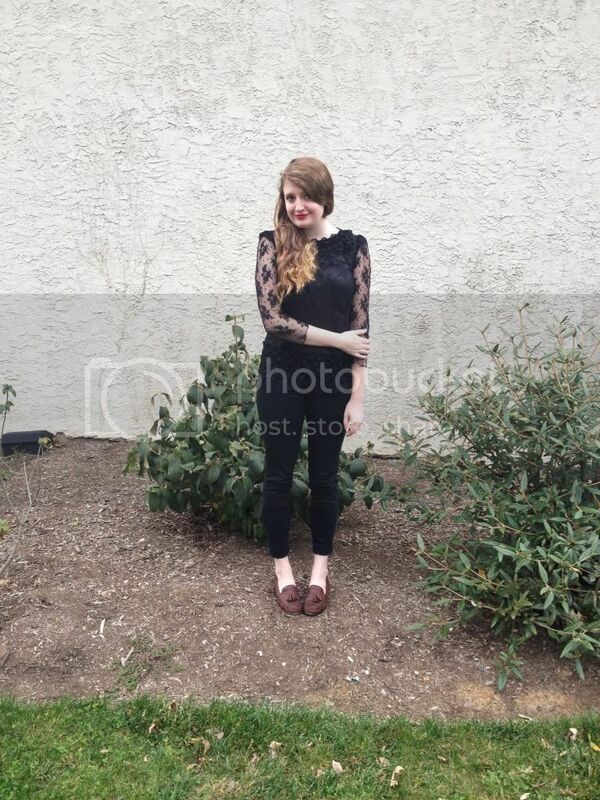 For this look, I styled a pair of black denim with a black lace blouse. This black lace top is one of my favorite tops in my wardrobe and I still can't get over the fact that this cost me less than $1 at a thrift store. I've had it for several years now and am just as in love with it as I was the day that I bought it. To keep the look from being bland, I threw on some bright red lipstick. Vintage loafers completed the look. Hello! This look was inspired by the adventurous, bohemian aesthetic of Free People. I styled my look around this burgundy paisley dress. Over top of the dress, I layered a burgundy sweater so the print of the dress is barely peeking out; just enough of the print of the dress is peeking out to capture attention. As for this sweater, I'm pretty much obsessed with it. I continue to reach for it again and again when planning out my outfits. Mid-way through the day, I realized that I actually wore this sweater in my last outfit post- whoops! Luckily, I styled it completely differently. 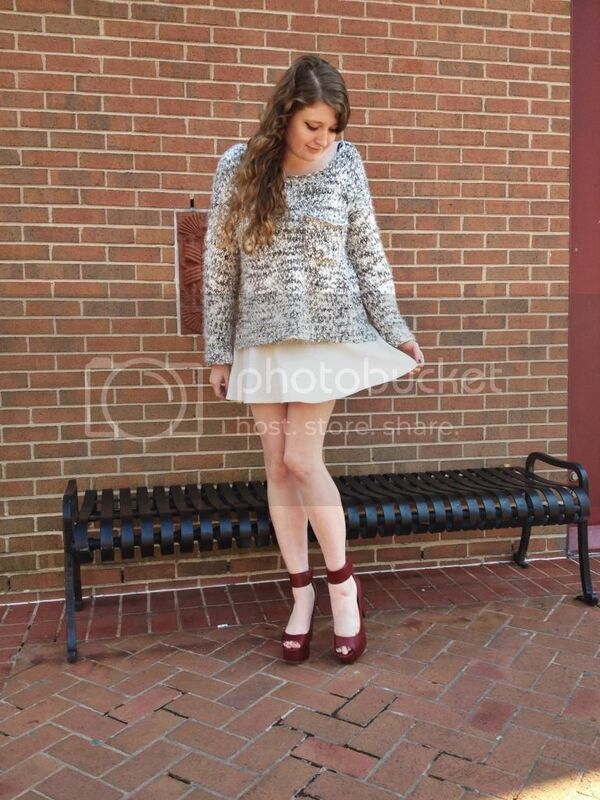 I mean really though how could I resist the deep burgundy color and mixed texture of the sweater? 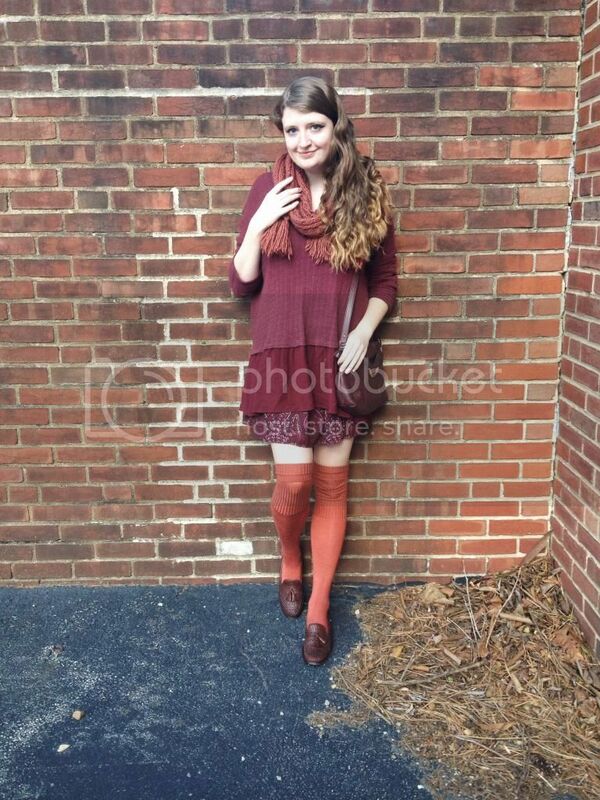 Chilly weather also prompted me to layer a cozy burnt orange scarf and knit thigh-highs with the look. Vintage loafers and a vintage bag completed my look. If only the weather could stay like this forever, I'd be completely content. I hope that your November is off to a good start! Like October, November is one of my favorite months of the year. I love all of the holiday festivities and events that begin in November from Thanksgiving to decorating for the holidays to holiday parties. On a different note, if you guys could please help me out and fill this survey out for my retail class and enter code RADV2, I would really appreciate it! The number of responses that I get contributes to my grade: https://fr.surveymonkey.com/s/product_philly I need 50 responses to get an A and the assignment counts as 20% of my grade. Results are due this Friday. Thanks! Hello! Today, I'm going to introduce you to online fashion retailer, RoseGal. 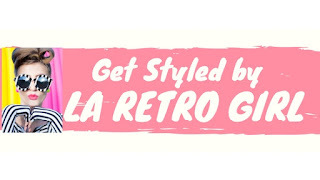 RoseGal offers a wide variety of women's apparel and accessories. They offer incredibly fashionable merchandise and have a very large assortment of merchandise to choose from. And RoseGal is the perfect shop for those who want to look stylish but don't have a ton of money to spend. Prices are extremely affordable and most of the items that I checked out cost less than $20. Fashionable clothing and accessories that don't break the bank? Yes, please! 1. Casual Style Scoop Neck Zipper Splicing Long Sleeve Dress $12.12. This dress is great for everyday wear and could easily be dressed up with golden jewelry. 2. Ladylike Style Color Block Slimming Packet Buttock Faux Twinset Women's Dress $17.15. The burgundy color of this dress is simply charming and I love the flowy style of the dress. 3. Stylish Off The Shoulder Solid Color Long Sleeve Dress $20.94. Love this little black dress! Perfect for a night in the city. 4. Vintage High Waist Solid Color Slimming Women's Full Skirt $10.07. I live in circle skirts and I love this option- especially for just $10! 5. Vintage Style Solid Color and PU Leather Design Women's Crossbody Bag $15.02. Such a classic bag that can easily be paired with almost any look. 6. Simple Style Color Block Tartan Plaid Elastic Waist Slimming Chiffon Women's Skirt $16.54. The plaid print of this schoolgirl skirt instantly drew me in. This would look great paired with a pair of black knee high socks and cozy sweater. ***Disclaimer: RoseGal provided monetary compensation for this post but I wrote the actual post and all opinions written in this post are mine. Hello! Today, I'm going to introduce you guys to TideBuy. TideBuy is an online retailer that carries a wide assortment of products including wedding apparel, special occasion apparel, accessories, everyday clothing, intimates, beauty products, bedding and even electronics. In particular, the stylish cocktail dresses from TideBuy really stand out to me. They offer cocktail dress options for everyone no matter what kind of dress you are looking for. 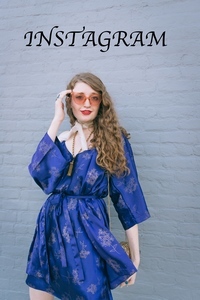 You can narrow down your search on their site by price, silhouette, train, embellishment, hemline, neckline, sleeve length, waist, season, occasion, style, back details, color or material. 1. Fancy A-Line Strapless Ruffles Mini/Short Cocktail Dress. $104.99. Who could resist the lovely navy color and the feathery skirt of this dress? 2. Pure Tulle Neckline Bowknot A-Line Short Homecoming Dress. $75.49. I really like how the simplicity of this dress creates such a crisp, minimalist look. 3. Brilliant Column Mini-Length One Shoulder Sweetheart Natilie's Cocktail/ Event Dress. $185.19. You can't go wrong with such a classic cocktail dress. If you are looking for a cocktail dress to wear to a formal event, I would recommend browsing through TideBuy's selection of cocktail dresses. With so many options to choose from, you are bound to find the cocktail dress that is perfect for you. ***Disclaimer: TideBuy provided monetary compensation for this post but I wrote the actual post and all opinions written in this post are mine.